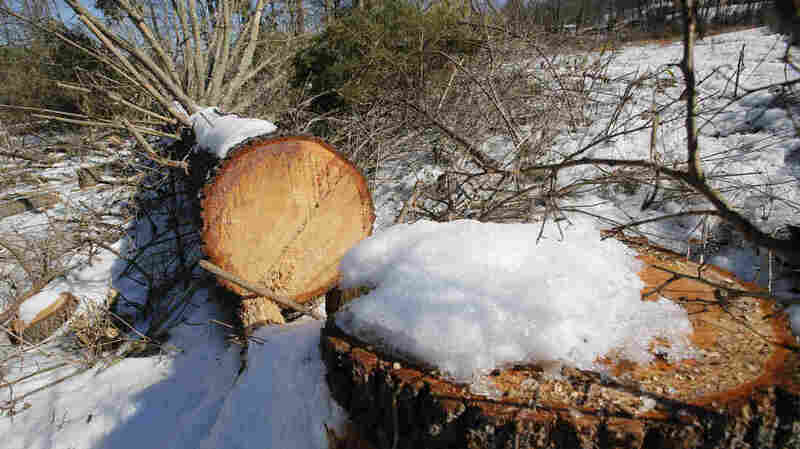 Quoting 'The Lorax,' Court Pulls Permit For Pipeline Crossing Appalachian Trail The federal judges noted "the Forest Service's serious environmental concerns that were suddenly, and mysteriously, assuaged in time to meet a private pipeline company's deadlines." A federal appeals court has thrown out a power company's permit to build a natural gas pipeline across two national forests and the Appalachian Trail – and slammed the U.S. Forest Service for granting the approvals in the first place. In a decision filed Thursday by the 4th U.S. Circuit Court of Appeals in Richmond, Va., a three-judge panel declared the U.S. Forest Service "abdicated its responsibility to preserve national forest resources" when it issued permits for the Atlantic Coast Pipeline to build through parts of the George Washington and Monongahela National Forests and a right of way across the Appalachian Trail. "This conclusion," they wrote in a unanimous judgment, "is particularly informed by the Forest Service's serious environmental concerns that were suddenly, and mysteriously, assuaged in time to meet a private pipeline company's deadlines." The judges cited Dr. Seuss' The Lorax: "We trust the United States Forest Service to 'speak for the trees, for the trees have no tongues.'" The court concluded that the Forest Service's decisions violated both the National Forest Management Act and the National Environmental Policy Act, and found the Forest Service lacked the authority to grant the pipeline a right of way across the Appalachian Trail. "Construction would involve clearing trees and other vegetation from a 125-foot right of way (reduced to 75 feet in wetlands) through the national forests, digging a trench to bury the pipeline, and blasting and flattening ridgelines in mountainous terrains. Following construction, the project requires maintaining a 50-foot right of way (reduced to 30 feet in wetlands) through the [two national forests] for the life of the pipeline." They note that in 2015, as the Federal Energy Regulatory Commission prepared to conduct an environmental impact statement on the project, the Forest Service noted concerns about landslides and slope failures, as well as impact on groundwater, soil, and endangered species. A draft of FERC's environmental impact statement stated that the pipeline route was designed to go through national forest lands rather than National Park Service lands, as the latter which would likely necessitate congressional approval. The Southern Environmental Law Center was one of the environmental groups that filed the lawsuit challenging the Forest Service's issuance of the permits. "I think what happened here is for years the Forest Service was asking tough questions about this project and requesting additional information and it turned on a dime when the Trump administration came into power," Patrick Hunter, a lawyer with the Southern Environmental Law Center, told West Virginia Public Broadcasting. "Federal agencies can change their minds, but they have to [have] good reasons for doing it and they didn't have a good reason to change their mind and turn on a dime like this and I think that came through in this decision-making." "The pipeline route that Dominion has chosen cannot be approved as of right now, and so if they want to keep working on this thing, they're going to have to go back to the drawing board," Hunter told the broadcaster. "All of the agencies that have to issue approvals for this pipeline — their approvals depend on this one pipeline route. And since that can no longer be built as planned, I think that calls all of those other approvals into question." Dominion Energy, the pipeline's lead developer, said it will appeal immediately to the full appeals court. "If allowed to stand, this decision will severely harm consumers and do great damage to our economy and energy security," Aaron Ruby, a spokesman for Dominion Energy, said in a statement to NPR. "Public utilities are depending on this infrastructure to meet the basic energy needs of millions of people and businesses in our region." According to Ruby, 56 other oil and gas pipelines already cross the Appalachian Trail — a few of them more than once. Natural gas pipelines are buried. From ground level, hikers would see a marker (like this one) alerting them to the pipeline under their boots, and a gap where the trees had been clear-cut. No trees are permitted to grow over top of a pipeline, because their roots can damage it. The Forest Service said in an emailed statement that it "will review the information received from the court opinion about the Atlantic Coast Pipeline and will be looking at our options before taking any action." As the Richmond Times-Dispatch notes, the environmental concerns are serious: "The panel said the Forest Service's 'insufficient analysis of landslide risks' also became clear when the Columbia Gas Transmission Pipeline, cited by FERC as an example of an existing pipeline built across sensitive terrain in the Appalachian Mountains, ruptured and exploded in early July after a landslide in West Virginia." Last week, following another order by the 4th Circuit, Dominion voluntarily suspended work on the project while it addresses issues with its permits. An earlier version of this story incorrectly said the pipeline would be buried at a depth of 600 feet. That would be the depth at the point it would cross the Appalachian Trail, but for most of its length the pipeline would be buried at a depth of about 4 feet.